Academic and Career Prep - A Pre University course for teens thinking about their future. The Academic and Career Prep, an enhancement of the University Prep programme, is designed to help international high school students prepare for the coming challenges of post-secondary studies and professional life in a supportive and academically stimulating environment. Combining critical exercises in self-reflection with an exploration of the study and career options available to them, students will come away from the programme with a better understanding of their own identities and life goals, and how to strategize for their futures. They will also learn how engaging deeply and creatively with the English language – beyond the basics of “ESL” – can help them realize their dreams. In this section, students are pushed to critically examine their own identities, values and belief systems to gain a deeper understanding of who they are, what they want to do in the future, and how they will get there. Classes also help students improve their ability to express themselves, whether on a college/university form or an employment cover letter. Students are asked to think about the coming challenges of post-secondary life with a focus on successful university/college applications, study strategies for the language proficiency tests commonly required for higher education admission (e.g. TOEFL, IELTS etc), and skills for success once they are admitted, including cross-cultural communication and identifying campus resources. In the written communication section of this class, students will learn how to critically engage with readings, and review the forms and standards suitable for writing essays in college/university, including the genre differences between major disciplines (e.g. humanities versus sciences). In the oral communication section, students master key competencies for academic success including group discussion, presentations, and active listening. Students are introduced to major career areas and discuss their current ambitions, which are then compared against the results of career aptitude testing. Drawing on the resulting interests of the students, guest speakers from related industries are brought in to give the class an overview of the typical career path,and what constitutes success in the field. The nature of work has changed dramatically in the modern, technology-driven world, and continues to evolve. Students today increasingly need “soft skills” that are transferable to various types of employment, and are adaptable to future changes we still don’t know about. This class builds on three skills identified by today’s employers as being the most important for success: empathy, innovation, and collaboration. Students in the Academic and Career Prep programme follow the activities organized for the students at CISS at Trinity. The activities have been designed to showcase the best that Toronto has to offer. Each week, students attend 1 full day excursion and 3 half day excursions as part of the programme. Transportation, meals, and admission costs are included. Welcome to one of the most beautiful campuses in Toronto, the Trinity College! Our downtown location puts the city right at your doorstep. Just south of the famous neighbourhood of Yorkville, you are a short walk to Yonge Street, coffee shops, stores and so much more. On campus you will find a comfortable, clean, and safe residence, a beautiful garden courtyard, air conditioned student lounges, and dining facilities that are modern…with a historic charm. Finally, WiFi is available throughout the campus. You’ll live in a single or double room in a university residence with other students attending this programme. Students are separated by gender within the residence. Each room has a bed, desk, chair, dresser and/or wardrobe. All bed linens are provided, along with a bath towel. Students must bring their own toiletries. There are card-operated laundry machines in the residence – we provide laundry detergent. Shared washroom and shower facilities are located on every floor. Safety is our priority so our staff live in the same residence, providing full supervision. 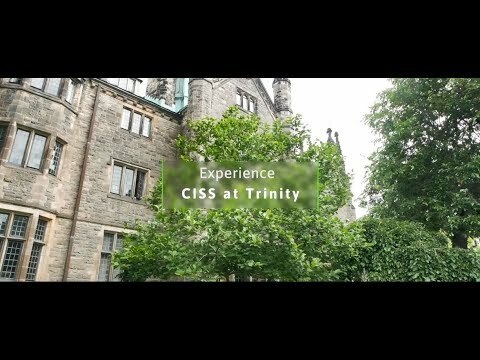 Learn more about CISS at Trinity. Academic and Career Prep programme takes place in the campus of Trinity College, in Toronto, Ontario, Canada.